After a lengthy and tumultuous decade plus of development and creative shake-ups, Marvel’s Ant-Man is finally upon us. Following the unfortunate departure of longtime Ant-Man fan Edgar Wright, I was extremely curious to see how the finished product would turn out under the guidance of director Peyton Reed. There was also something very intriguing to me about making the final film in Phase 2 of the Marvel Cinematic Universe a low-scale heist comedy as opposed to the cataclysmic action behemoths we’ve come to expect from Marvel Studios. Given my thoughts on the bloated destructive action from the climax of Avengers: Age of Ultron earlier this year, I cannot fault this decision. 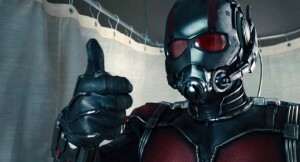 Ultimately, we will never see Edgar Wright’s Ant-Man. With that said, his vision is not entirely absent from the finished product. The heist concept Wright and his co-writer Joe Cornish (who both retain story and screenplay credit) is still very much the focus of the film. How is the film overall? I would compare Ant-Man to eating a cheeseburger from Five Guys. I enjoyed myself in the moment but came away with little worth remembering. It’s a film that works best in segments instead of as a cohesive whole. Ant-Man begins with a flashback to 1989. 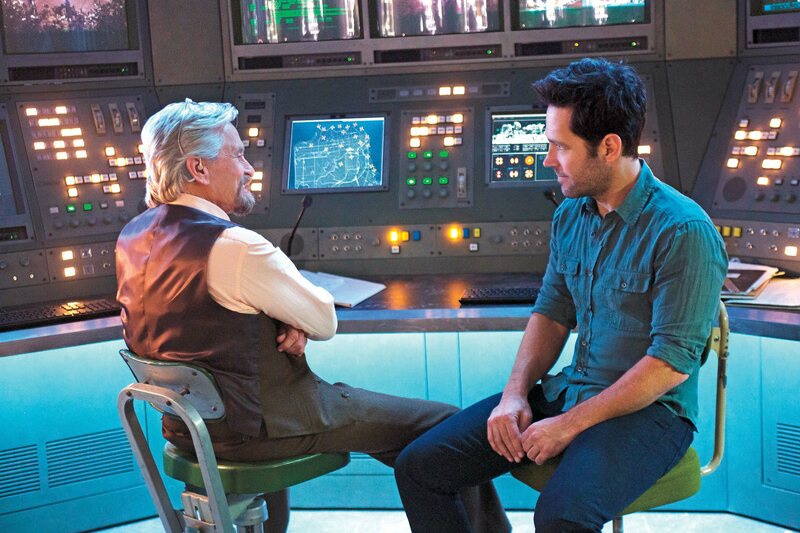 Dr. Hank Pym (Michael Douglas) resigns from his position at S.H.I.E.L.D. upon discovering a plan to replicate his shrinking technology for use as a weapon. Pym locks the formula away with the proclamation that no one will ever get their hands on it. The film proceeds to jump ahead to present day. 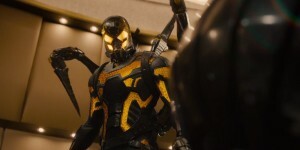 Pym has been subsequently pushed out of his own company by protegé Darren Cross (Corey Stoll) and his daughter Hope (Evangeline Lilly). Hank and Hope have a strained relationship, both in a business and a personal sense. Their relationship takes even more of a downward turn when Hank turns his attention to recently-released petty thief Scott Lang (Paul Rudd). Lang cannot hold a steady job and is kicked out of a birthday party for his daughter by his ex-wife (Judy Greer) and her husband (Bobby Cannavale). Hank offers Scott a shot at redemption by utilizing the shrinking technology to steal similar technology from Cross before he sells it to those with similar aspirations of military utilization. On the notion of Cross, he truly is one twirl of a moustache away from being a clichéd evil businessman. I’ve been a frequent critic of how Marvel Studios has characterized the majority of their villains, and Cross is no exception. His backstory and relationship with mentor Pym is not all that different from Jeff Bridges’ portrayal of Obadiah Stane in Iron Man. However, Stoll lacks the endearing charm of Obadiah, and there’s no mystery or plot twist to go along with his cunning demeanor. He gets a couple of moments in the third act, but there’s never a point where he feels like a legitimate threat or a sympathetic character due to his drive to please Pym. Say what you will about Aldrich Killian, for example. In Iron Man 3, at least I felt a sense of danger whenever he appeared on-screen. The emphasis on the Cross/Pym relationship as opposed to an emphasis on the titular character is a big flaw for me. 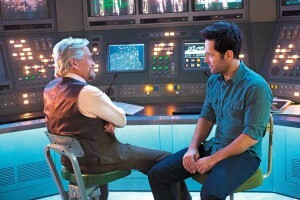 Whenever the focus is placed on Scott Lang, Paul Rudd is given the opportunity to show his true talent and charisma. Rudd, who collaborated with director Peyton Reed in Yes Man, makes the most of what he is given. Almost all of his comedic beats worked for me, and I thought he had good chemistry with his co-stars. I don’t have an issue with his performance as much as I do with the material he was given. I never felt that Lang took center stage within the film. Outside of the relationship with his daughter, he doesn’t have much of a character arc. Part of that is attributed to his lack of an edge. Looking back, I think Hope donning the suit would have been more fascinating, given how it’s brought up within the film. I don’t want to come across as if I didn’t enjoy the film, because that’s not true. Due to the smaller-scale stakes (no pun intended) compared to other Marvel films, the characters take center stage. The parallel father/daughter relationships aren’t shoehorned plot points, and they never seep into overly-sentimental territory. Lilly and Douglas are excellent in their respective roles. Their arguments never feel manufactured, and Rudd plays off of them in a believable manner. Most of the comedy made me laugh, with the exception of Michael Pena. I didn’t laugh at any of his scenes, especially not in his in-sync voiceover monologues. Those are some of the moments that felt like imitations of Edgar Wright’s style of comedy. He was more of an annoyance than an intricate part of the story. The character moments are not strictly substitutes for action sequences. When Reed showcases the action from the perspective of Ant-Man, it’s a visual treat. Seeing how the suit works helps to enhance the action set pieces as the film progresses. The destructive action of most Marvel films is restricted to a house during the climactic showdown between Cross and Lang. Contrary to a lot of Marvel films, I thought the third act was the strongest and most exciting part of the film. Part of that is due to the sheer amount of exposition given within the first two-thirds of the film. The action sequences in general were well executed and the highlights of the overall film. There’s great utilization of everyday objects such as bath tubs and Thomas the Tank Engine that compensate for the lack of global destruction during the last third. With that said, they also detract from the amount of danger Cross presents. As an overall film, Ant-Man doesn’t quite mesh together. Each act of the film possesses a different tone and style. It’s almost as if it was directed by different people at points. With that said, the sluggish first two-thirds were saved by an exciting and creative third act. It’s a film that feels like filler to tide us over until the release of Captain America: Civil War next March. It doesn’t really tie into Avengers: Age of Ultron outside of minor mentions and an action scene featuring a surprise Avenger (I won’t spoil who). It’s certainly competent and amusing when need be, but not much more than that. Based on the high bar Marvel Studios has set for themselves, it is somewhat disappointing that it’s not more than that.